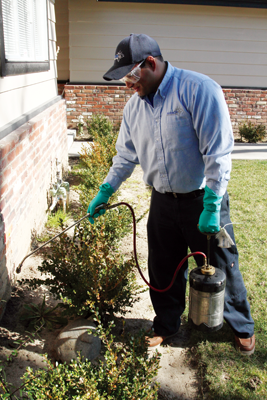 Our general pest control division offers many different services. Our Residential and Commercial Customers are able to choose from regular services, one time services and also services tailored to specific pests. We want to make sure all of our customers needs are being met easily and quickly. This is why we have staff on hand who are licensed and trained to understand your pest problems and get you the help you need right away. Bi-Monthly Service - Our most popular service is The Bi-Monthly Service, which is a regular service once every 2 months. This service includes calling prior to the service, cleaning webs around all windows and doors, extra service when needed at no additional charges and a Technician who is dedicated to your needs. Monthly Service - We also offer a Monthly Service for those clients who wish to have more control on their home, especially during the summer months. One-Time Service - Our third service is a One-Time Service, which we offer for those who may wish to have pest control done sparingly to bring down the numbers of insects, arachnids or other pests as a yearly service. The One-Time Service is an opportunity for us to show our customers how much of a difference we make for your home. By doing so, we can continue to help with your pest control needs in the future. Along with general insects and arachnids, we offer service for Bed Bugs, Pantry Pests, Rodent Control, Wasp Nests, including difficult to reach areas like attics and Insects on Plant Stock. We make sure our customers needs are being met by taking the extra time in these busy days for the simple things. We do keep one Technician for each customer so that a trust and friendship develops over time. Because our Technician is taking care of your home we want to make sure you know him/her well. We also require the Technician to call prior and notify before performing any service. This allows the Technician an opportunity to see how the customer is doing and if there is any additional work we can help with. We take the extra time to make sure our customers are happy with their service. Our customers know we care about their well-being and that their pest control needs are being met. Sometimes, our customers come across pests which they have been able to identify, we are able to identify the pest for you. We have an in office microscope and we are more than happy to identify specimens, click here for information on how to submit a specimen to us. Click here to contact us regarding general pest control or to make an appointment. Thank you! We will respond to your message within 24 hours during normal business hours.